Yesterday in Beirut's main square with a crowd in the tens of thousands on hand, the Vatican's Saints Czar Cardinal Jose Saraiva Martins presided at the beatification of the Lebanese Capuchin Yaaqoub (Jacob) Haddad (1875-1954), the country's famed builder of schools, social institutions and a community of sisters. Alongside the Portugese curialist and the Maronite Patriarch Cardinal Nasrallah Sfeir, at the head of the congregation sat the nation's president, prime minister and parliament speaker. The miracle securing the new blessed's ascent to the altars came courtesy of the 1998 cure of a Lebanese woman suffering from a malignant tumor. Sfeir outlined how Haddad "passed through the narrow door leading to sainthood," attributing the priest's ability to walk "the difficult road of a saintly life to three virtuous practices: surrender to the will of God, Christian modesty and the work of mercy." 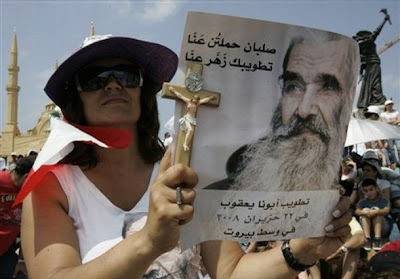 "Father Yaaqoub would say that 'All God has given me belongs to Him and the poor of Lebanon," added Sfeir, in reference to his first point regarding the late pastor. "He built hospitals, schools and took care of the sick, yet he was a man of simple means - Father Yaaqoub put his trust in the grace of God." Sfeir, describing the four "pillars of modesty" that characterized Haddad's life, again quoted the priest, saying: "Do not bestow virtue upon yourself that is not present within you; credit the Lord for that which is good in us; do not praise yourself in the presence of others; and do not count the shortcomings of those close to you in order to raise yourself." Once communion had been received, Sister Mary Makhlouf, who heads the Sisters of the Cross order of nuns, a network founded by Father Yaaqoub, capped the ceremony in a speech touching upon the broader meaning of the day. In the shadow of Mohammad al-Amin Mosque, the nun spoke of "seeing Jesus in Father Yaaqoub, overcoming the divisions, barriers and [narrower] affiliations in the nation that is a humanistic message." The sister continued, as the crowd met nearly her every word with an ovation, saying that "sainthood is not a restriction, but a good turn ... and can lead one to the message of salvation. It matters not who, where and how we are - we all need someone to love, to help and be helped by." "This nation, whose concept was founded on the contact of cultures, must - no matter what the differences and difficulties facing us - serve as a model of coexistence," she said. "The 17 communities that form this country should be a source of wealth, rather than discord ... Lebanon should spread its wings like an eagle and shed light into the heart of darkness, as the sky is lit by the rising sun." 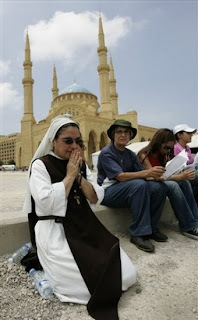 Sister Mary ended by expressing her hope that "the years spent for Lebanon and the Lebanese people in an appeal [to heaven] will be accepted, allowing Lebanon to remain." As the rites unfolded in the capital, violence continued in the country's north, with six dead and 40 wounded yesterday as a new round of clashes broke out between pro- and anti-government groups.